The IN3425PE is a very stable, pin-point accurate ionizer with a photoelectric eye that controls power and air flow. 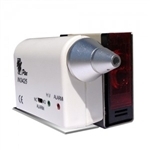 The Model IN3425PE 68KHz AC ionizing air nozzle is a point-of-use solution for a wide range of static problems. The IN3425PE easily connects to a com-pressed air source and offers various output nozzles for specialized applications. Using AC corona technology to make the air more conductive, Ptec™ ionizers pro-duce a balanced stream of positive and negative air ions that never need calibration. These devices are used in many industries and manufacturing applications where static electricity is a problem. Ptec™ ionizers save time and money because they require no calibration. Emitter life is increased and maintenance frequency is reduced, due to 68KHz AC ion emission. The IN4000PE flexible nozzle neck frees the operator's hands during assembly and manufacturing processes. A photoelectric eye controls both ionization and airflow, which reduces compressed air costs and extends the life of the ionizer. 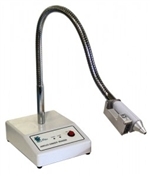 The model IN4000PE ionizing air nozzle produces a 68KHz AC output of approximately 2200V and a continuous stream of balanced air ions.